Our earliest records of Central Asian history come from Chinese records documenting various Chinese inroads into the e region, as well as recording tribute received from Central Asian nations. . The earliest records appear in the of the Early Han period, under the reign of the Emperor Wudi (141 BC-87 BC). 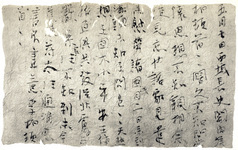 It was under Emperor Wudi that the imperial envoy Zhang Qian (02) made his legendary journey through Central Asia and his reports are contained in such Chinese documents as “Accounts of Ferghana” (in Records of the Grand Historian); Dynastyand “Geographical Accounts of the Western Area” (in History of the Han Dynasty). Although the purpose of his journey was solely political, the information about Central Asia which he brought back was significant in helping to open up trade routes between east and west. Emperor Wudi, using the knowledge brought back by Zhang Qian, pressed ahead with aggressive military campaigns in Central Asia, sending great generals such as Wei Qing and Huo Qubing to fight against the nomadic Xiongnu (Huns). In 121 BC, he succeeded in expelling the Xiongnu from the Tarīm Basin, and then in 102 BC, he invaded Ferghana in order to extend his control over neighboring countries in the region. (For more on the history of the time and the legendary blood-sweating horses see Digital Silk Road’s “The Horses of the Steppe: The Mongolian Horse and the Blood-Sweating Stallions”) For about 100 years, the Early Han controlled the trade routes passing through Central Asia. It was around this time as well that the Kingdom of Loulan became a puppet state of the Chinese Han, thereby changing their name to Shan-shan in 77 BC (06). The Han control over Central Asia, however, was loosened for approximately 60 years when Wang Mang usurped the throne and established his Xin Dynasty. Chinese control of the region resumed once again during the Later Han Dynasty, under Emperor Mingdi (57-75 AD). General Ban Chao (a younger brother of Ban Gu, the author of History of the Han Dynasty) ruled the region in a peaceful manner for many long years. During this time, the countries of Central Asia were reduced to subservient status with some under direct Han rule-- and then later Wei and Western Jin rule―and with others retaining their independence but made to pay tribute to the Chinese court. Of the two different historical periods represented in the ruins found in Mīran (07), the older ruins (date of origin unknown up to end of the third century) were built and abandoned during this period. Resulting from the political turmoil which occurred at the end of the Western Jin Dynasty, China was divided into north and south, in what is known as the Southern and Northern Dynasties period (420-589). In the north, Chinese and non-Chinese steppe peoples (known collective as the Wu Hu―or five non-Chinese nomadic tribes), established the short-lived Sixteen Kingdoms. Some of these tribes attempted to extend their power over Central Asia, intending to gain control of the trade routes in the region . In the famous “Li Bo Document(1) (in 328) (06) found at Loulan, we learn that the later Liang Dynasty had gained control of the region. During this period, as mainland China fell into political disarray and conflict, the main east-west trade route through the Hexi Corridor became insecure. The Tuyuhun tribe exploited this situation to make forays into the lucrative east-west trade using another route through the Qinghai region during the fourth to the seventh centuries (07). The period of the Northern and Southern dynasties was also a time when many Buddhist priests immigrated to China from Central Asia. The period saw the flowering of Buddhist culture in Central Asia, and it was in this period that much of the great cave temple art was created in the region. The Kizil Caves (04), for example, were constructed starting in the the late third or the fifth century and the Mogao Caves in Dunhuang (05) in the second half of the fourth century.